Kotai Jingu, or Ise Jingu Naiku (皇大神宮) is the Grand shrine of Ise located in Ise, Mie prefecture. Historically, Jingu has held the most honored place among all Shinto sanctuaries. It is considered to be the spiritual home of the Japanese people, most of whom wish to make a pilgrimage to Jingu at least once during their lifetime. 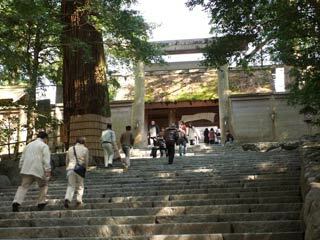 In fact, more than six million pilgrims and worshipers come to Jingu every year. Amaterasu Omikami is enshrined in the main sanctuary building of the inner sanctum of Naiku, in which the august mirror is kept and worshiped. As they are most sacred, neither the august mirror nor the main sanctuary building may be seen y pilgrims or other visitors. The architectural style of the main sanctuary is known as yiitsu shinmei zukuri, which is unique to Jingu and is said to be the purest and simplest style of Shinto architecture. The Goshoden is periodically used for the food offering ceremonies of the various lesser sanctuaries. Like the main and auxiliary sanctuaries, the Uji Bridge is rebuilt in keep with the twenty year cycle of the Shikien Sengu. The Uji bridge spans over the sacred Isuzu river which, as the many poetic references made to it will reveal, has captured the imagination of the Japanese people. The building situated to the right of the saikan is for the exclusive use of their Majesties the Emperor and Empress on the occasion of their pilgrimage to Jingu. Three times a year, the Emperor sends an envoy to Jingu to officiate at maor ceremonies on his behalf. By venerating Amaterasu Omikami, who is the ancestral god of the Imperial family, the Emperor prays for the protection and welfare of the Japanese nation and for peace in the world. The hills beyond Jingu are part of the sacred grounds of Naiku. Until the Middle Ages, all timber used in the reconstruction of the sanctuaries of Jingu on the occasion of the Shikien Sengu was obtained from the Kiso Gifu and Nagano Prefectures.